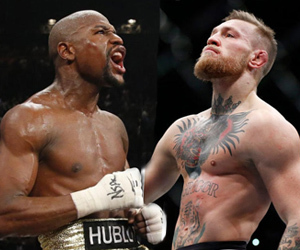 In recent months, there’s been enough buzz about a possible Floyd Mayweather-Conor McGregor bout to prompt sportsbooks in Las Vegas and offshore to post odds on the fight. That buzz got a little louder in the past day or so, with UFC chief Dana White indicating McGregor is all in, leaving Mayweather as the sticking point. So, has all that buzz translated to action and line movement? To a degree, yes, primarily due to the bulk of the action coming on big underdog McGregor. But oddsmakers remain quite skeptical of the fiery Irish MMA fighter. Online sportsbook SportsInteraction opened Mayweather a hefty -5,000 and McGregor +1,200. But as with other shops, a mass of McGregor cash has moved those numbers to Mayweather -1,200 and McGregor +500. Holt made a similar point, adding his expectation that all that tightening line movement due to dog money will very quickly head in the reverse direction. He believes that when the date is inked, the price on Mayweather will go up because sportsbooks will actually take bets on the favorite. Oddessa is surprised the fight has written as much action as it has – one-sided as it is – without having a date or location yet. He believes at least some of the driving force behind the wagers is a desire to see someone knock Mayweather off his unbeaten perch, with a 49-0 record. | Date: MAY 19, 2017.